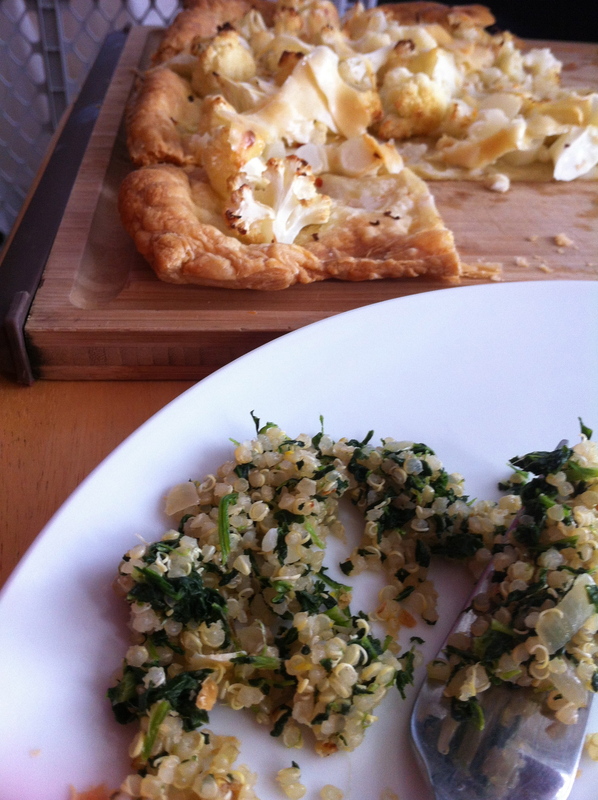 Lunch: a Quinoa-Spinach Pilaf and a Cauliflower-Pecorino Tart. Both are from who-knows-what-issues of EveryDay Food. (I’ve been going through *all* the recipe magazines in the house and tearing out all the recipes I want to make One Day – and I didn’t even realize that the EveryDay Food pages aren’t labelled with month/year. Apologies). So I was sitting with the babies while ripping out pages, sorta looking at the recipes, and I happened to think a) these two recipes looked yummy and b) I have most ingredients on hand. Voila! Lunch Menu! I defrosted the puff pastry on the counter, gathered all the other ingredients – did you know that in professional kitchens there’s a PHRASE for gathering all the ingredients together? Mis En Place. Don’t we sound all educated now? Once the puff pastry was thawed I rolled it out on top of a Silpat(I ran outta parchment paper like a week ago) and then transferred the Silpat to a baking sheet – wait, a Silpat is a silicon sheet that sits inside your baking sheets, like a reusable parchment paper. Cleans easier than scrubbing the baking sheet. 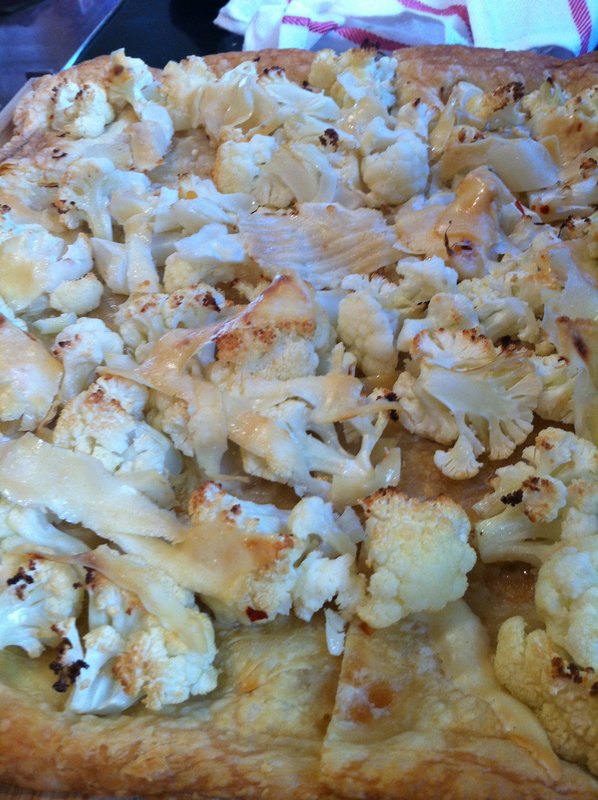 You season the veg with a little garlic, olive oil, s/p and crushed red pepper flakes. You score the edge of the pastry to make a border (I also rolled the edges in a bit to make a more distinct edge to the tart) and then add the seasoned cauliflower florets, top with shaved Pecorino and pop into a hot oven for 30 minutes. C said that Next Time(I love when he uses those words) I make this, I should add another 1/2 cup of cheese to the pastry 1st, THEN layer on the veg and the other 1/2C of cheese. He said it was good, but more cheese would make this even better. Baby review: J ate all the cauliflower off the tart, R only ate the pastry. They make a good team. 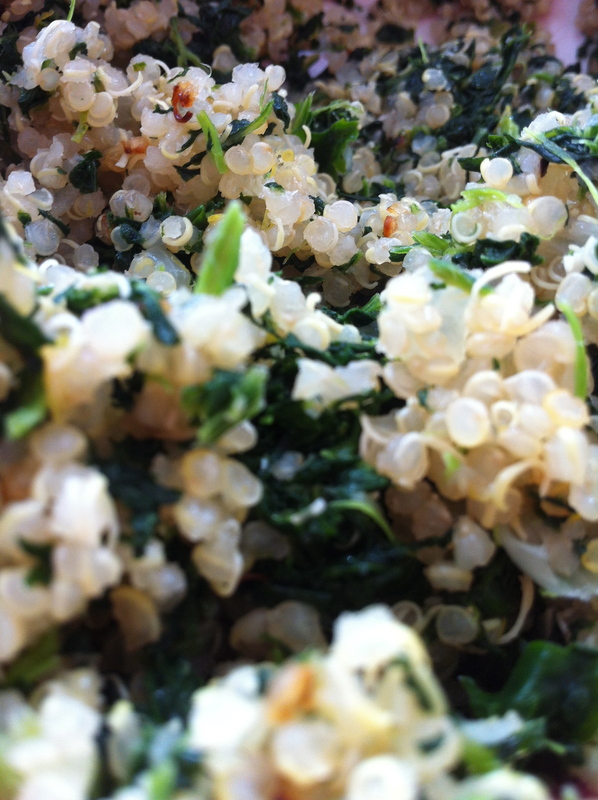 The Quinoa – meh. It’s an ok side dish. Nothing spectacular. R wouldn’t even taste it. She’s being funny about spinach lately…. J had some. Seemed to like it. To make it, you fry a small onion in some olive oil, add in some garlic and then the washed/drained quinoa – that must be where the ‘pilaf’ part comes in, the frying in the pan…. So you’ve got some onion, garlic and quinoa all set to go – and you add some water, bring it to a boil and let it simmer away on the stove for 20 minutes or so until all the water is absorbed. Then you add in the spinach. I didn’t have 5C of fresh on hand, so I used 10oz of defrosted. When everything is all mixed together, you add in some lemon zest and season with s/p. I dunno that I’d try this recipe again… I really wanna like quinoa. I really really do…. 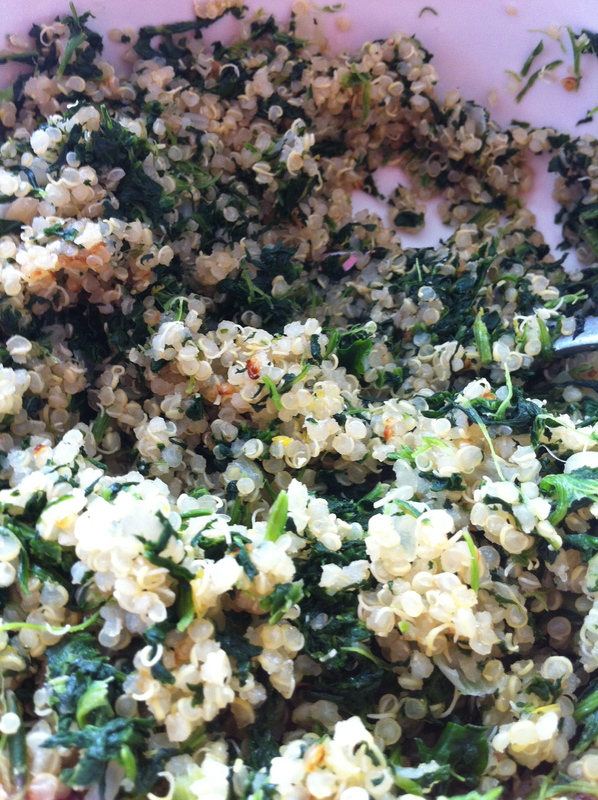 I keep remembering the Quinoa salad my friend Barbara makes…THAT was good. Roll out puff pastry on a lightly floured work surface (I just used the Silpat), then transfer to either a parchment lined baking sheet, or just lift the Silpat off the counter and onto your baking sheet. With a sharp knife, lightly score pastry 1/2″ from the edge, creating a border. Toss Veg + Oil + Garlic + Red Pepper. Season with Salt/Pepper. Bake until pastry is a deep golden color and puffed up, about 30 minutes. Let cool slightly before cutting into squares. 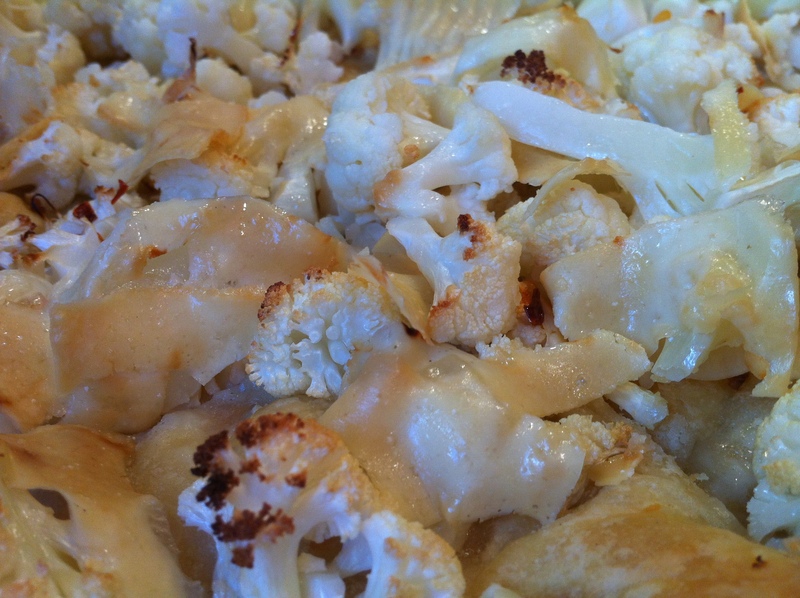 **I used the entire head of cauliflower for this recipe and it turned out to be twice as much as I needed for the tart. I threw the rest of the florets onto a separate baking sheet and roasted them to eat later in the week. 1- Melt butter in a large saucepan. 2- Add in onion, stir. Add in garlic, stir. 3- When softened (3-4 minutes) add in Quinoa, stir. 4- Add water and bring to a boil. 5- Reduce heat to a simmer, cover and cook until water is absorbed (about 20 minutes). 6- Off heat, add in spinach and zest, then season with salt and pepper.